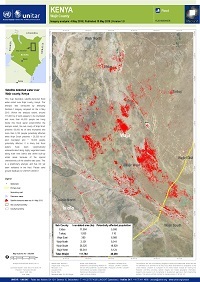 This map illustrates satellite-detected flood water extent over Wajir county, Kenya. The analysis was conducted by analyzing Sentinel-1 imagery acquired on the 4 May 2018. Within the analysis extent, around 111,800 ha of land appears to be inundated and more than 46,300 people are living inside this flood water extent.Within the analysis extent, the sub county of Wajir West presents 68,000 ha of land inundated and more than 6,100 people potentially affected while Wajir South presents ~ 26,300 ha of land inundated and ~ 19,000 people potentially affected. It is likely that flood waters have been systematically underestimated along highly vegetated areas along main river banks and within built-up urban areas because of the special characteristics of the satellite data used. This is a preliminary analysis and has not yet been validated in the field. Please send ground feedback to UNITAR UNOSAT.